(NEW ORLEANS) – October 12, 2016 – What do you get when you mix Remoulade’s signature cuisine with the nationally acclaimed breweries, from Louisiana to Michigan? 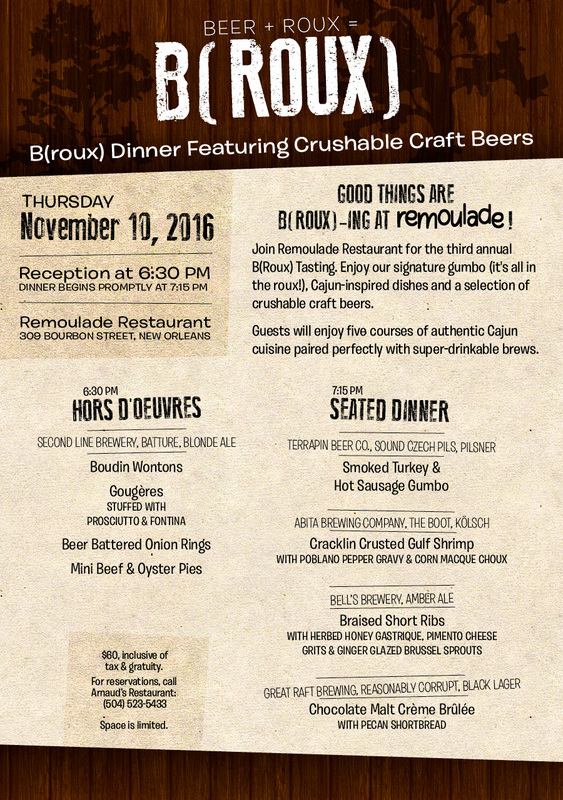 The third annual B(Roux) Tasting Dinner at Remoulade restaurant, Thursday, November 10, with hors d’oeuvres starting at 6:30 p.m., and a seated dinner following promptly at 7:15 p.m. Guests will enjoy four courses of Remoulade’s authentic Cajun cuisine, complemented by crushable craft beers from Second Line Brewery in New Orleans; Abita Brewery in Covington; Great Rafting Brewing in Shreveport; Terrapin Beer Co. in Athens, GA; and Bell’s Brewery in Kalamazoo, MI. The cost to attend the third annual B(Roux) Tasting Dinner at Remoulade is $60 (inclusive of tax and gratuity). For reservations, call (504) 523-5433. Space is limited.